Île Ste. Croix, only 6½ acres in size (approximately 100 yards wide by 200 yards long) is located in the Ste. Croix River, which defines the border between the US (Maine) and Canada (New Brunswick). Île Ste. Croix s the site of the first French attempt to colonize the territory the French called La Cadie (Acadia), and the location of one of the earliest European settlements in North America. The year was 1604. Under the leadership of King Henri IV, France had recently emerged from a prolonged period of religious warfare and civil strife between Catholic and Huguenot (Protestant) forces. One such Huguenot and champion of the King was Pierre Dugua, Sieur de Mons. Dugua was granted the title of Lieutenant-Governor for New World territory between the 40th and 46th parallel (modern Philadelphia and Labrador) by the King. He was also granted a trading monopoly for the fur trade, and was expected to colonize the territory and to convert native peoples to Christianity. In March, Dugua led five ships from Le Havre to establish a settlement in the New World. The ships carried 120 men, including artisans, soldiers, a Catholic priest, a Huguenot minister, cartographer Samuel de Champlain, and noblemen Jean de Biencourt, Sieur de Poutrincourt, and François Gravé, Sieur de Pontgravé. The expedition landed at Sable Island, off the coast of Newfoundland, on May 1. From there, three ships carrying 41 of the original 120 men headed to the St. Lawrence River to trade. Meanwhile, Pierre Dugua searched for an appropriate spot to establish his settlement along the coasts of what is now Nova Scotia, New Brunswick, and Maine. By late June, after exploring the mouth of the Saint John River (New Brunswick), Dugua's group of 79 men sailed into Passamaquoddy Bay and up a river. Here they found a small island situated inland near the confluence of what appeared to be three rivers resembling the arms of a cross. Dugua named the island Île Ste. Croix. Immediately work began on clearing the island and neighboring mainland to construct their dwellings, a kitchen, a storehouse, a blacksmith shop and a chapel. With construction going well, Champlain was sent off by Dugua to explore further south. After having explored as far as Mount Desert Island, Maine, Champlain returned to Île Ste. Croix in late September to find the dwellings completed. By October 6, the first signs of winter were upon the settlers when it snowed. Soon the river filled and jammed with ice flows and the men on the island were cut off from the mainland. They began to suffer from a shortage of drinking water and firewood. Lacking fresh fruit and vegetables, the men fell ill to scurvy, caused by a lack of Vitamin C in their diet. By winter's end, 35 men, nearly half of the original complement of 79 men, had died from this disease. The latitude of Île Ste. Croix is much further south than that of Paris. The settlers had not anticipated the harsh New World winters and were not prepared for the conditions. When Pontgravé's ship arrived on June 15, 1605, Dugua had already made the decision to move the settlement to a more suitable site. Therefore, Dugua and Champlain continued to explore the southern coastline, traveling as far as Cape Cod before returning to Île Ste. Croix without having found a more suitable site. Pierre Dugua then decided to relocate across the Baie Française (Bay of Fundy). By early August, the settlement at Île Ste. Croix was being dismantled to move to the Annapolis Basin in Nova Scotia. Port Royale, as named by Champlain, was the crew's new home. Dugua returned to France to defend his trade monopoly, never again to set foot on New World soil. 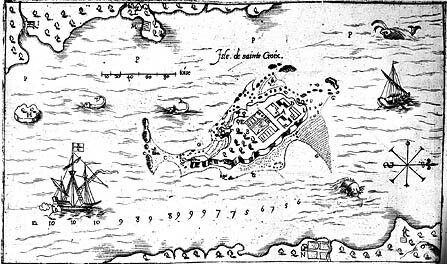 In 1606 and 1607 Champlain and Sieur de Poutricourt visited Île Ste. Croix and noted that the gardens were still producing. Meanwhile, Dugua’s monopoly was revoked and the settlers returned to France leaving the island and remains of the settlement to the Mi’kmaq (Micmac) Indians. In 1613, Captain Argall of the English colony in Virginia was ordered to drive the French from the coast. He destroyed the remaining buildings on Île Ste. Croix and sailed to Port Royal, where he burned down that habitation while the French were working in the fields. Île Ste. Croix disappeared from the records until a late 1700s boundary dispute between the newly founded United States and Britain, who disagreed on the identity of the St. Croix River. Canadian Robert Pagan, using Champlain’s maps and documents, located the island and found ruins, French brick and pottery, thus identifying both the island and the river and establishing the international boundary. In 1949, Île Ste. Croix, on the US side of the border, was declared a US National Monument, and in 1968 Parks Canada agreed to cooperate with the US Parks Service in preservation of the island. While it is difficult to visit the island itself, both countries have park sites on their respective banks of the river overlooking the island identifying and explaining this early French presence in the New World.